Blue Beetle and Robin attack Kara and weaken her. Alex is informed Catherine is having some trouble with Lois, and he says they will only be able to break half of Superman's heart today. He leaves to take care of the problem, telling Miss Martian to extract from Kara's mind the information he needs on Superman. At the hospital, Catherine is sedated and Lois leaves to write her story. Father seems to think Alex is being overly emotional due to the "near depletion" of his Kryptonian solar cells. This angers Alex, who heat visions Father and destroys it. Then Kara arrives, punches Alex, and uses super-breath to instantly incapacitate Blue Beetle and Robin. Alex tries to control Kara's mind, but fails due to Miss Martian apparently not being mind-controlled at all. After she reveals to Alex how she did it, Kara punches him again and puts him down for the count. 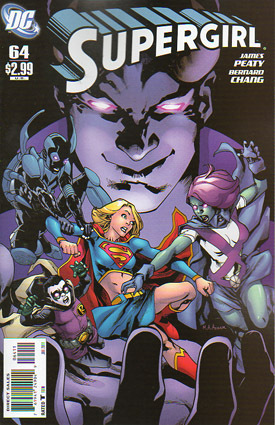 Kara talks to Lois and reveals Alex's control over Catherine has been broken, but she can't write her story on Cadmus because they struck a deal with the "authorities" to rehabilitate Alex in exchange for keeping their involvement out of the press. The experience has left Kara feeling she's ready to step up if anything ever happened to Superman, and then she flies off to save a jet. Story - 2: After all the build-up, this was quite a bit of a letdown for me. A story that started off so promising ended with a whimper. At least it seems it has moved Kara to a more confident place, but it remains to be seen how long that will stick. The entire Lois/Catherine subplot was, sadly, completely unnecessary and an utter mess. It held no relevance to the story at all, and didn't even give Lois a good story. In fact, it was handled so poorly that Lois comes off looking like she has no sense of justice or journalistic integrity. She won't write the story because Cadmus struck a deal "with the authorities"? Could that be any more vague or meaningless? And what "authority" has the power to tell the free press what stories they can or cannot run? I can certainly believe some government organization would try to get a story killed, but I cannot for a SECOND believe that is something that would sit well with Lois Lane. She's better than that, by far. It also doesn't make much sense even within the story's own framework... Cadmus does bad stuff, completely messes up, and in the end gets their mistake back in exchange for nobody talking about their mistake? What are they, a bank that's "too big to fail"? Zing. In any case, the ending of this arc really floundered and I'm sad to see such good potential at the beginning squandered by a messy and largely pointless ending. Art - 2: So, so tired of Paris Hilton Supergirl. And I don't know what's up, but now even Lois looks less impressive (and like she weighs about 80 pounds). Cover Art - 3: Well executed, but quite cliché and done a thousand times before. That being said, the interior was so weak I'm not sure what else could have been done here to make it seem more appealing.